Who else would try to take pictures in the early 1960s at the White House in DC only to have just been warned if that she took said pictures, she would have her camera confiscated and be possibly jailed for it? I have heard this story a million times and as a kid I didn’t quite get it, but now I do!! See back when my mom was a kid, she took this trip to DC with her parents (my grandparents). My grandmother was famous for taking pictures all the time where-ever she was. We still have albums with tons of photos spanning the years of her life, because she just had to take these pictures, document everything and not miss a moment. Now that she is long gone (not forgotten) and did unfortunately pass away a few years ago, I more then get her rationale and it is truly amazing to see these photos of her from her youth through the years. I guess then the apple doesn’t fall far from the tree, because I love taking photographs of my family and literally am using my camera daily now. Also looks like, I married the perfect man, because not only does Kevin work for Canon (yes, the camera company), but he also taught basic photography for high schoolers before losing his position due to the economy and budget cuts. As most know, I began a 1 Snap a Day Photo Page on my blog this past January chronicling my family’s daily adventures here for all. I honestly just love taking pictures of everything and don’t want to miss a moment. I admit I was using my iPhoto out of convenience at first, but as many know Kevin got me a brand new Canon Point and Shoot camera for Mother’s Day and have been taking photos in style since. So, when I was asked by good friend, Michelle over at A Dish of Daily Life, if I would be interested in sampling and reviewing WeMontage, which to me is a photo lover’s dream come true (more about his in a moment), I gladly jumped, because this service appeared to be something that would be a good fit for the photographer in me. After exchanging a few messages back and forth, I then got to speak to James Oliver, Jr., the owner of WeMontage, who was so easy to talk to and so very down to earth. I found out we had more then a few things in common having grownup in similar neighborhood areas and even being married with small kids, twins to be exact for James. WeMontage was created from his vision after having watched an episode of interior design show on TV, where they were decorating an entire wall with the family’s photos. James decided he would love to do something similar with is own family and thus came about his creation of WebMontage. WeMontage’s James Oliver’s Lovely Family!! 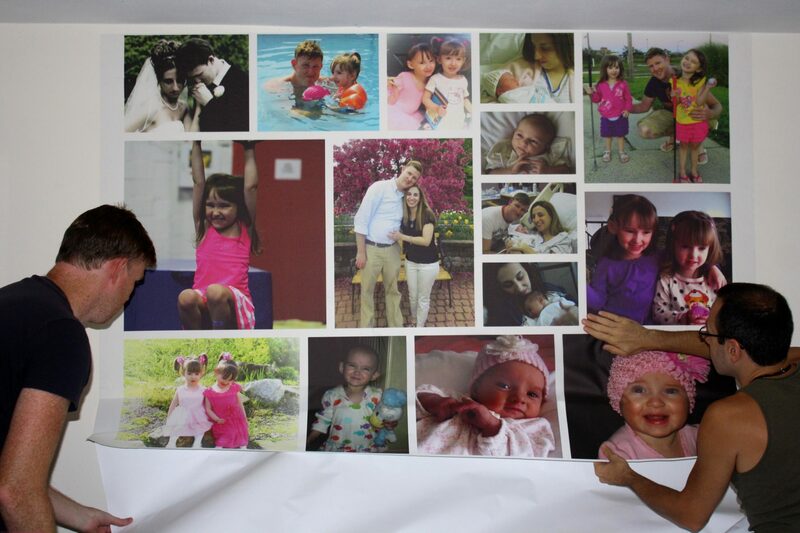 WeMontage is removable wallpaper that allows one to begin the process by uploading all your favorite family photo memories or moments to then create your very own custom photo collage that will be printed on your very own removable wallpaper to hang and display in your own home. Here is Michelle from A Dish of Daily Life’s WeMontage Collage!! I must tell you that I had so much fun going through my millions of photos, I knew I wanted to showcase some of my favorite moments, but also tried to include from over the years. I had about 35-40 photos that I started out with and narrowed it down to 15. I wanted to make sure that the photos were large enough to see and not just thumbnails, so that is why I opted for more rather than less. I also made sure to have enough of each of my girls, as well as my husband and myself, too. In the end, I created a 6ft. by 4t collage, but please know these are custom so you can create smaller or larger collages. The choice is yours. Just keep in mind that WeMontage charges $10 per square foot. And once you have decided on the size, you can then get working on the positioning of the photos. You must keep in mind the sizes of the photos you choose though, because this will determine placement as you are shuffling the arrangement of your photos. Another One of My Very Good Bloggy Friend’s Tamara’s Camera Blog’s WeMontage Collage!! The shuffling process might be a bit frustrating at first for some, but as James explained to me, you want to make sure that for the photo resolution that you get the best placement possible and that is what the software accounts for when it randomly shuffles. And I must say, he was truly correct here and couldn’t be happier with the resolution quality of the printed out photos in my collage. So, they do shuffle and position in certain places for a reason and definitely keep this in mind, when working with the shuffling portion of the software. Also, know that if for some reason the collage doesn’t look its very best they will contact you and try to resolve the issue. This hasn’t happened often, but it is good to know that James and his staff are there to make sure that your collage comes out just perfect. They are also thinking of ways to possibly improve the software process of shuffling. James even called me to discuss my further thoughts on this after I did indeed use the company’s software to create my collage. So stay tuned, because I know James had a few wonderful options in mind and in possible works, too! He really is so brilliant and know he is constantly trying to improve above their already wonderful product and service, because he takes pride in this, as he should, because WeMontage is absolutely fabulous! However back to my order at hand. Once I did place my order, (James by the way had told me very often they print on the same day and they do take into account for drying time, but ship out pretty quickly thereafter) it arrived within a few short days and James was truly correct on the timeframe. The Proof I Was Sent Once My Order Was Placed!! I just couldn’t wait to open it and hang it up. It is recommended when hanging to have two people to hang it on the desired wall. By the way, you hang your WeMontage in any room and they are ideal for living rooms, bedrooms, nurseries, kids bedrooms and even home offices. 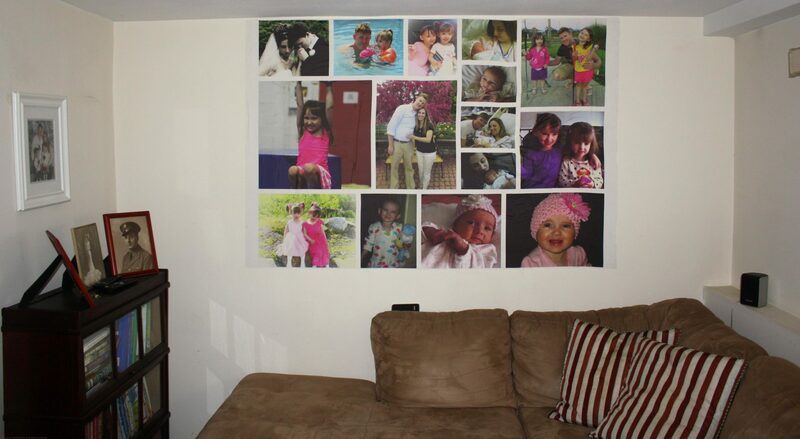 We chose our living room wall, because it was large enough and also so the whole family could enjoy it. I enlisted my husband and brother to help with the hanging process! In our home, my husband, my brother and I hung it. My husband being the artist thought to use painter’s tape to tack up the top before beginning to unroll the photo paper. Pretty clever, but we did have a near mishap, which I will be honest I thought was going to ruin it. See though sometimes the removable wallpaper can stick to itself, but no worries, it will not tear and James is right it is so very durable and it held up to the test with us having to pull one section apart from it sticking to itself. And in the end, it was hung up beautifully (thank you to both my husband and brother for putting up with me during this process). And when was all done and hung up, I even was able to surf my iPad. Sitting after hanging up our WeMontage surfing my iPad! And my girls were also so very overexcited to see themselves in a larger format and went through each photo telling us what they were doing and when the pictures were taken. 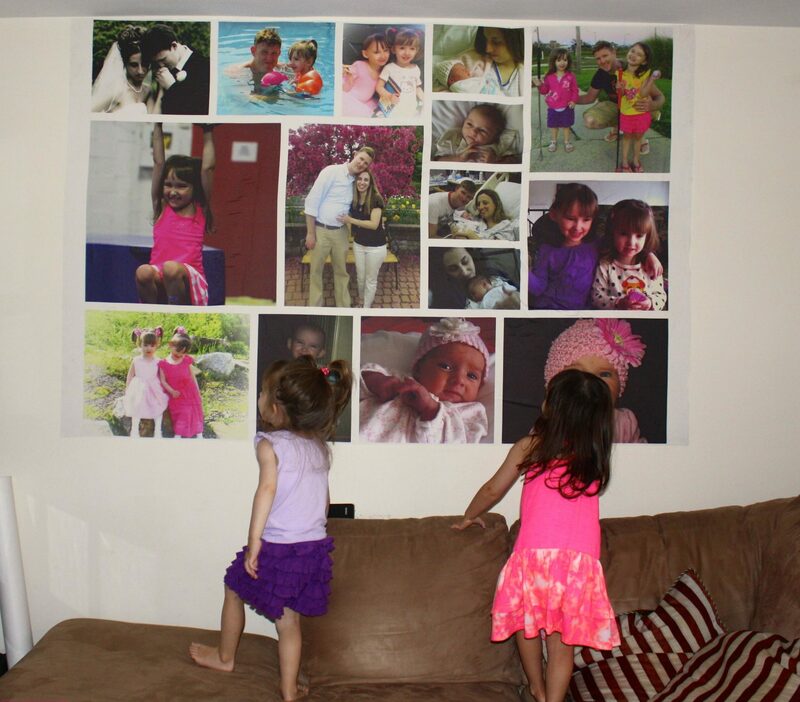 The Girls Fascinated by Seeing Our Pictures Hung On Our Living Room Wall!! And of course, my husband and I were so pleased to have all our most wonderful family memories to indeed display on our wall to remind us now daily of these special moments. By the way, my grandmother would be proud of how my photography chops have paid off!! And now are you asking how you, too can get one for your very own home? Well, you can take a better again at WeMontage to learn more.. You can also like them on Facebook, and follow them on Twitter. And thanks to James at WeMontage for the next week, they are offering my readers a very special discount of $50 off using the code JANINE. So happy photo collage shopping!! Last, but certainly not least, please don’t forget to check out my web design company for specials running at J9 Designs for all your web design needs. I LOVE the way yours turned out. I didn't realize it was so big, but I love that it's oversized like that. That’s awesome. Love this idea. That’s what my kids need in their room since they destroy anything in a frame!! Thanks, Erin. The frame thing is pretty funny. What a great gift… wonder if they can make smaller ones? that is such a great gift! Yes! The pic of the girls is pretty spectacular. It came out beautiful Janine! I love how your girls were pointing out what they were doing in each picture…that's what it's all about, being able to go back and re-live and enjoy our memories. That's the reason we take photos in the first place…to remember good times! This is such a great way to enjoy your photos every day!! Thanks for linking to mine – I love working with James, Michelle and YOU! So many great ones in one post. I love what you did and I love all of the colors. My kids also couldn't stop looking at it when we hung it up. Whenever someone visits, that's the first thing they want to see – and that's over our life-sized Han Solo in carbonite in our dining room! Awesome, awesome. Yes, your grandmother would be proud! My recent post Compartment Therapy. Tamara, you are the best. Wonderful Janine this gem has to be my favourite ! !As you know I love experimenting with all the photos I take and I am saving this one too for future reference. Yu have such a wonderful family and you are to be congratulated on all you manage to do. Wonderful and sending you lots of love from Wales. My recent post 38 weeks. Oh so hope your day is starting out great, too. And I think this would work perfectly in the girls' room. 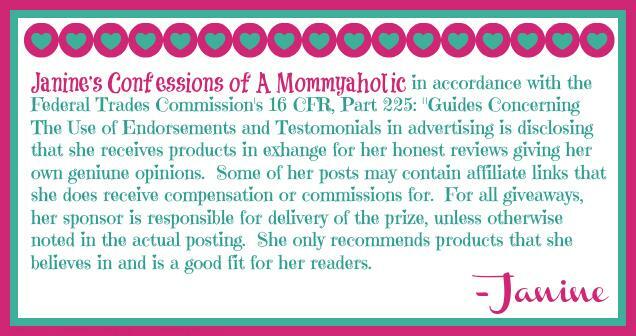 I hope you do look into it and will tell you this really is one of my favorite reviews to date!! 🙂 xoxo!! Janine! I've seen another review on this service/product and I thought it was brilliant! Being a photo lover myself, I think it's a wonderful idea and super cool! What a fabulous way to display your memories :o) Hope you have a great Tuesday! My recent post We can all benefit from eye exercises; especially our children! I absolutely loved it on Michelle's page, Tamara's is awesome, and yours is just incredible too. I am definitely getting persuaded to give this a try! I've been trying to figure out what to put on the living room wall. I think this might be it! The pictures were great, and I'm sure the Montage thing is very helpful, but my favorite part of this blog was the introduction since I'm so big on introductions. Well done Janine! Written like a pro. 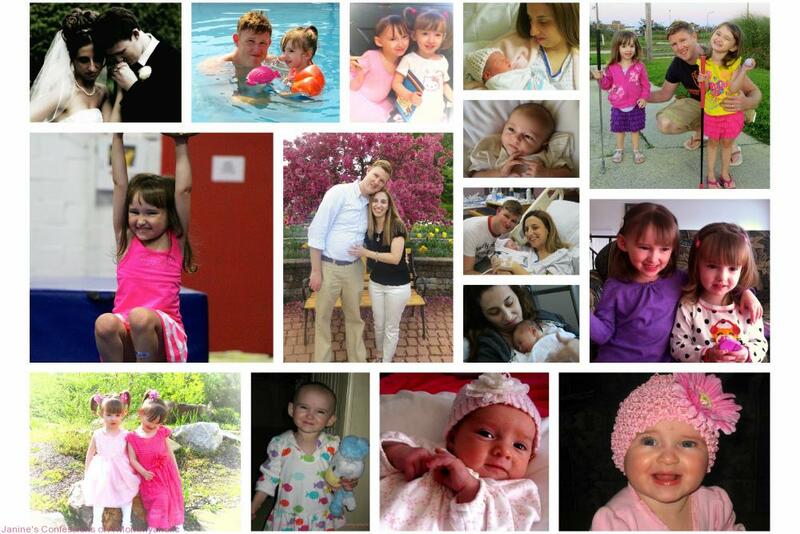 I love seeing all these We-Montages – yours looks great, Janine! Cool, J9, and a great decorative piece too!! Better than putting up portraits or paintings that are impersonal! My recent post Rocking songs about commitment, or lack thereof! I am a lover oftaking photos myself. It gives me so much joy to scan over all of the memories. My favorite is when I forget about some of them and then run across them just to have those memories flash back. This is absolutely so perfect. Janine, what a beautiful montage you have put together. Yes your grandma would be proud. I first saw this on Michelle's blog, and am loving see everyone's memorable wallpaper hung up. I wish I had more space than a 1 bedroom apartment! Totally my pleasure Nancy and thanks for stopping by, too!! I love the size, the concept, and the look. These are PERFECT!! Thanks, Rosey! So glad you like WeMontage. I love this, Janine! What a cool way to decorate a room! Awesome! Seriously fab. And so cool about your grandmother taking photos in the white house anyway. Glad she didn't go to jail (but bummer they took the film!). Thank so much Kristi and I was seriously so happy to try this out and get to share, because I couldn't agree more is absolutely fabulous!! and my mom actually reminded me today what my grandfather said in return to the man when he confronted her (my grandfather had a very sarcastic sense of humor). He told the guy, "Go ahead take away" and my poor mom was crying! Yeah only in my family, but no she never got arrested and the got off with the warning of the film being confiscated!! This is such a cool concept. Love how it turned out and what a nice brother for helping you hang it. Thanks Aunt Gloria and hope you get to see it real soon now!! 🙂 xoxo!! that is really cool. I could probably wallpaper my home with all the pictures I've taken! I really love the idea! Trust me Dara, I had to really pick only the essentials, but I too have tons and tons of photos. So, it took me time to pick only a few hand selected here!! That is so cool! As you described everything I envisioned myself making one for our family. I think it would be so cool over a dresser. Yours turned out wonderful and I love how excited your girls were about it. These are so cool. I love how yours turned out. Hope you have a great day. I loved how your collage turned out to be. I have been wanting to do this…will give this a try. HI Ruchira, we'd be excited to earn your business. Let me know if I can help in any way.